Buy Desdemona Wren a Coffee. ko-fi.com/desdemonawren - Ko-fi ❤️ Where creators get paid by fans, with a 'Buy Me a Coffee' button. 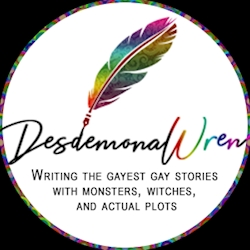 Desdemona Wren is a multi-talented creator who utilizes her time to white some of gayest novels you'll ever read whilst also providing social media and idea support for authors, artists, and musicians as well as drawing comics, writing fanfiction and being an all-around indie cheerleader. Secured Payments. Support goes to Desdemona Wren's account. Upgrade Desdemona Wren to a yearly Gold Membership with a one-time payment.